The only biographical information known about him is contained in his famed Book of Knowledge of Ingenious Mechanical Devices. Like his father before him, he served as chief engineer at the Artuklu Palace, the residence of the Mardin branch of the Artuqids which ruled across eastern Anatolia as vassals of the Zengid dynasty of Mosul and later of Ayyubid general Saladin. 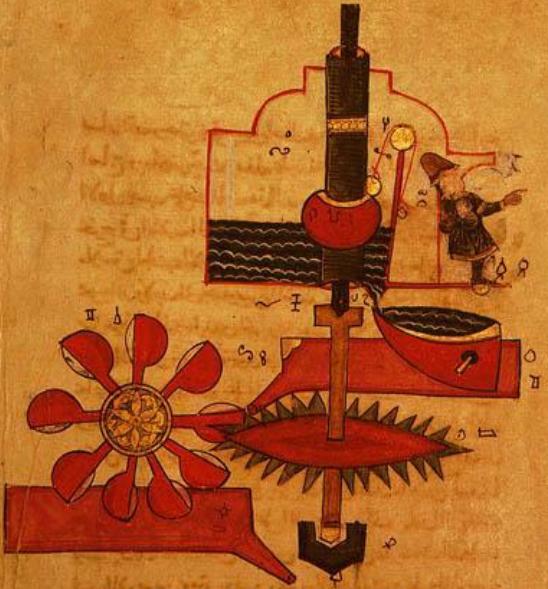 Al-Jazari was part of a tradition of artisans and was thus more a practical engineer than an inventor who appears to have been “more interested in the craftsmanship necessary to construct the devices than in the technology which lay behind them” and his machines were usually “assembled by trial and error rather than by theoretical calculation.” His Book of Knowledge of Ingenious Mechanical Devicesappears to have been quite popular as it appears in a large number of manuscript copies, and as he explains repeatedly, he only describes devices he has built himself. According to Mayr, the book’s style resembles that of a modern “do-it-yourself” book. 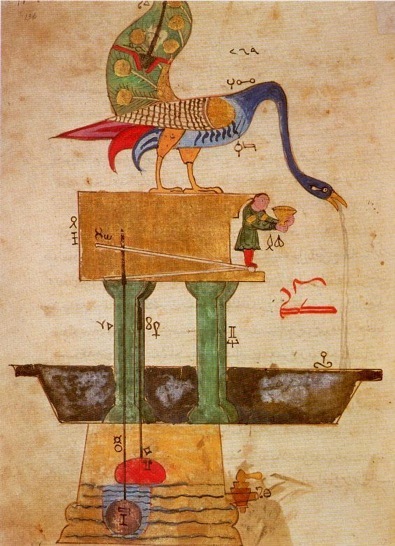 Some of his devices were inspired by earlier devices, such as one of his monumental water clocks, which was based on that of a Pseudo-Archimedes. 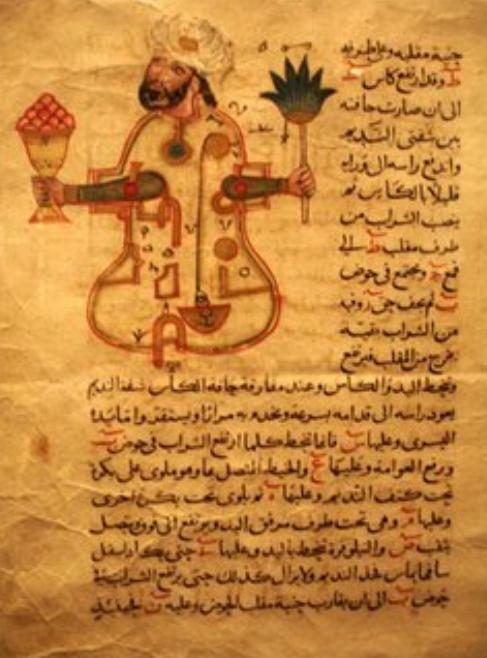 He also cites the influence of the Banū Mūsā brothers for his fountains, al-Saghani for the design of a candle clock, and Hibatullah ibn al-Husayn (d. 1139) for musical automata. 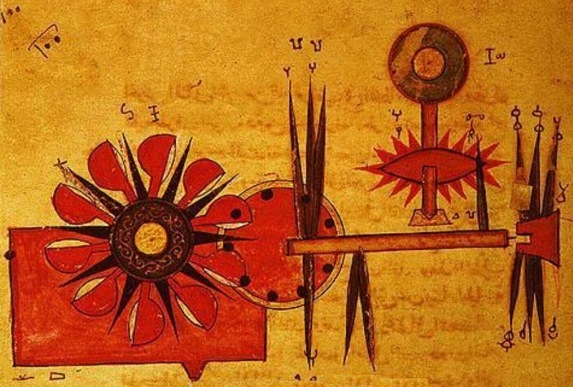 Al-Jazari goes on to describe the improvements he made to the work of his predecessors, and describes a number of devices, techniques and components that are original innovations which do not appear in the works by his precessors. He was called Al-Jazari after the place of his birth, Al-Jazira, the area lying between the Tigris and the Euphrates in Mesopotamia. 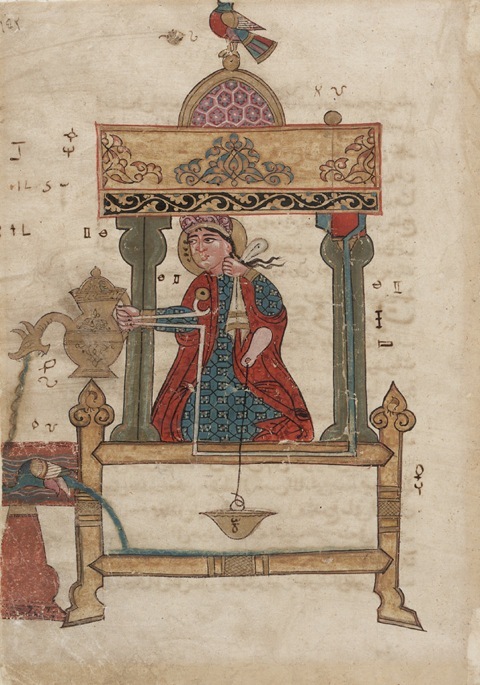 Like his father before him, he served the Artuqid kings of Diyar-Bakir for several decades (at least between 570 and 597 H/1174-1200 CE) as a mechanical engineer. In 1206, he completed an outstanding book on engineering entitled Al-Jami’ bayn al-‘ilm wa-‘l-‘amal al-nafi’ fi sinat’at al-hiyal in Arabic. It was a compendium of theoretical and practical mechanics. George Sarton writes: “This treatise is the most elaborate of its kind and may be considered the climax of this line of Muslim achievement” (Introduction to the History of Science, 1927, vol. 2, p. 510). Figure 5: Picture of the internal structure of an automata for dispensating liquids. Heuden at Virtual Worlds. (Source). 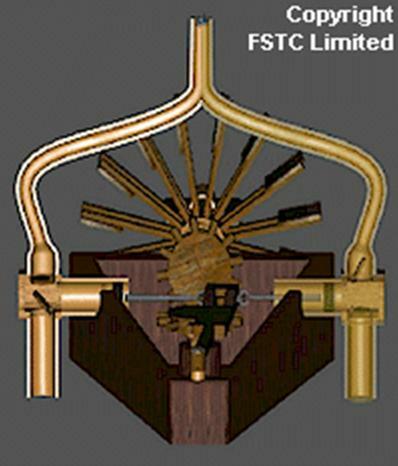 Figure 7: 3D model recreated by FSTC of the double action pump of Al-Jazari. to view the animation. 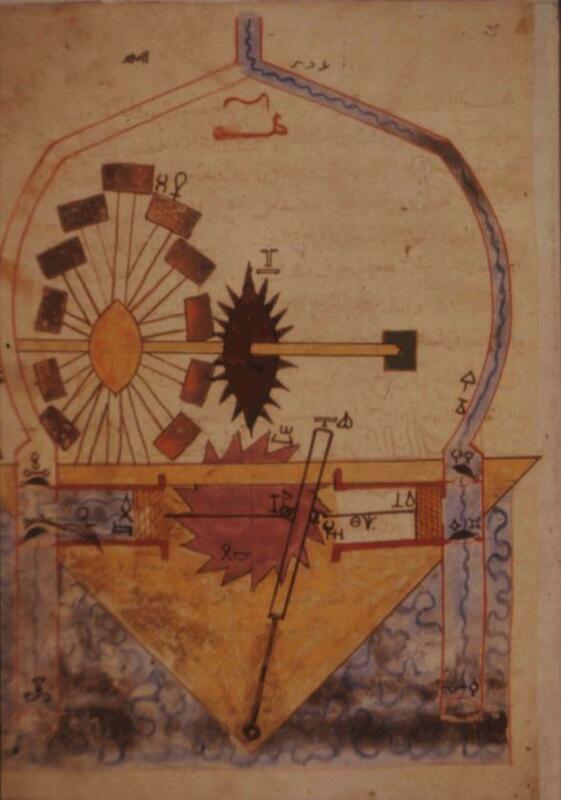 In their paper on “Mechanical Engineering during the Early Islamic Period” (published in I. Mech. E, The Chartered Mechanical Engineer, 1978, pp. 79-83), C. G. Ludlow and A. S. Bahrani have raised the important point that it is more than likely that there is more on the subject in some of the thousands of Arabic manuscripts in the world libraries which have not yet been inspected closely, and obviously require looking into. 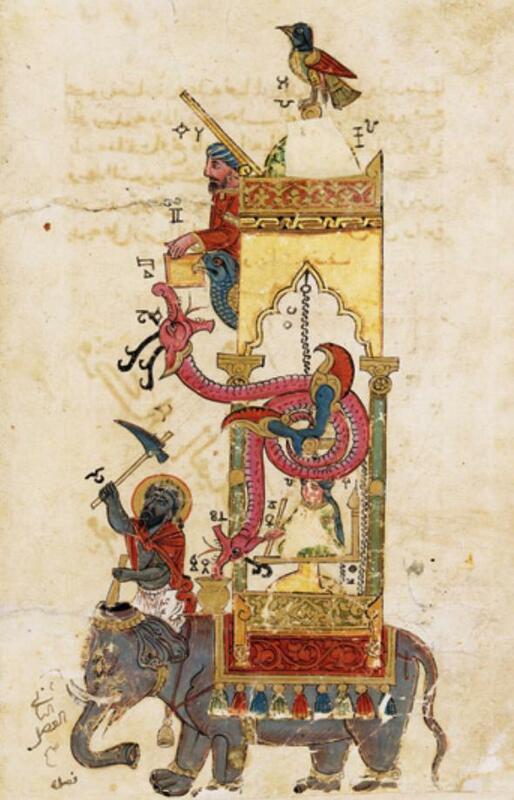 Figure 8: View of The Elephant Clock: Leaf from a manuscript of Al-Jazari’s Kitab fi macrifat al-hiyal al-handasiyya dated 715 H/1315 CE. The other issue is related to fine technology. One of his concluding points states that “it is hoped that, as research proceeds, firmer evidence for the transmission of Islamic fine technology into Europe can be provided.” Hill also offers some hints for such transmission. The most likely route was Spain. Such fine technology could have followed the same route as the astrolabe (itself part of this fine technology.) Apart from Spain, there were other possible lands of transfer: Sicily, Southern France, Italy, Byzantium and Syria during the Crusades. Hill is also right on a further account, that what will be seen in this work is just a fraction of the whole process, which, as with much else has hardly been explored. 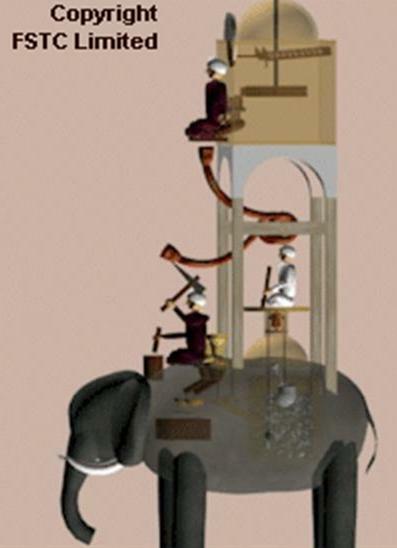 Figure 9: 3D model recreated by FSTC of the Elephant clock. to view the animation. 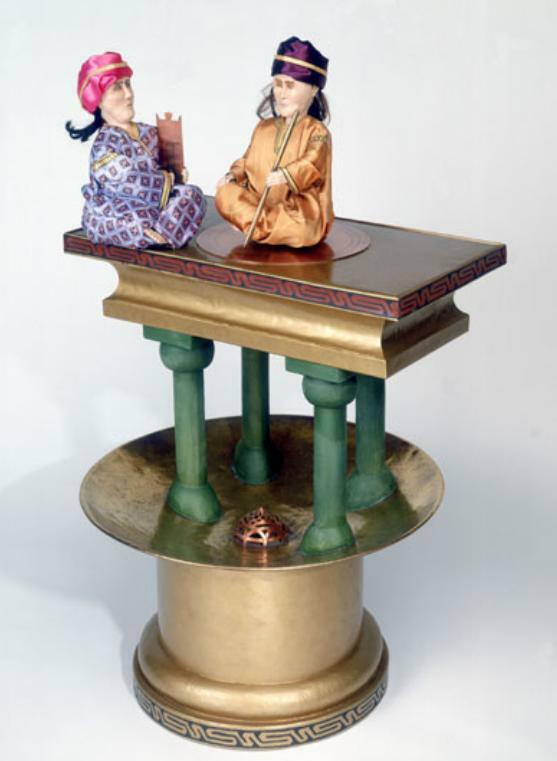 Figure 10: A table device automaton designed by Al-Jazari. 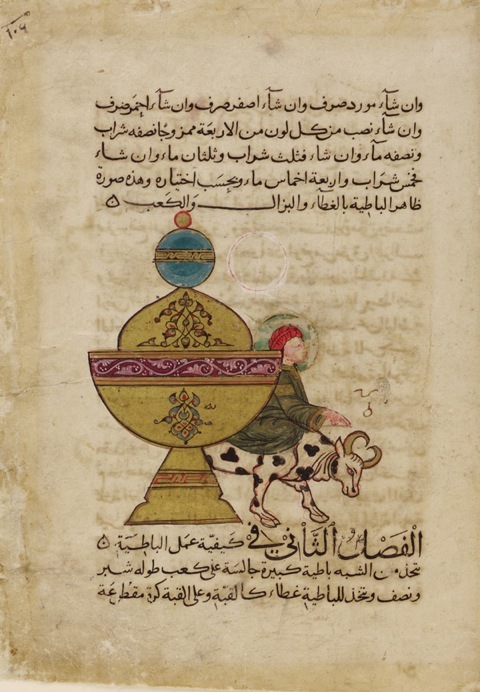 Manuscript dated from the early 14th century (1315), copied in Syria by Farrukh ibn Abd al-Latif. Opaque watercolor, ink and gold on paper. 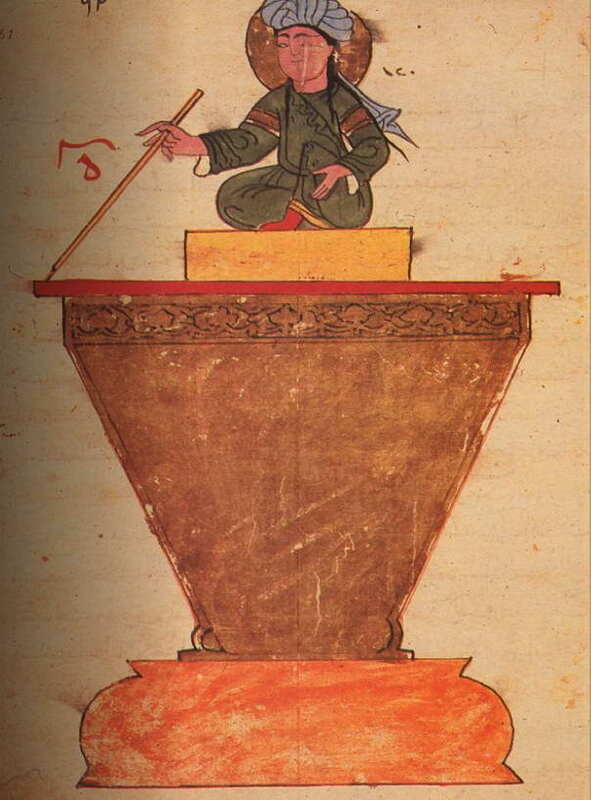 Figure 11: A large ewer held by a kneeling female attendant in a domed pavilion designed by Al-Jazari: once the bird whistles, water pours into a basin below; a duck then drinks the used water and releases it through its tail into a container hidden under the platform.